We’re all familiar with Google Maps – they have become a universal tool we all use to easily navigate the world. We know how to click and drag our mouse around to enjoy 360° virtual reality views of the road. Even on our cell phones, we expect to pinch, zoom and swipe our way around our city streets. Google 360 Virtual Business tours, allows you to do the same thing—pinch, zoom, and walk around—inside businesses. Using the same Google Maps technology people searching on the web for services can now discover not only your profile, but can get a fully interactive 360° virtual tour. Just think about the all the advantages. Whereas before your business could have blended in with every other competitor with all the boring photos, business descriptions and promises, now people have a real reason to hang around and investigate your Google Location page, website, and business. You can even use different views from the tours to promote different aspects of your business – as this restaurant does featuring different rooms for private parties. Chances are the longer they stay on your business page, the ore likely they’ll be doing business with you. With so many thousands of businesses out there trying to reach the same clients, you need every advantage you can get! 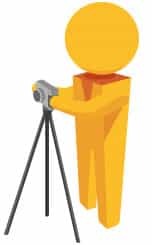 Is My Business Eligible for Google Street View? Do clients or customers come to your physical location? Do you take pride in your place of business? Do you have a Google local page? If you answered yes to these questions or at least to most of them, then you are definitely a good fit for Google Business View. Don’t have a Google Local page? No worries, let our experts set that up for you. Your virtual business tour will be featured there for all the world to see. Invite customers inside to experience your business’s ambience and decor with familiar Street View navigation. Customers can see Google Maps Street View on their computers, smartphones or tablets. On average, restaurant listings that included Street View|Trusted had a 30% higher click-through rate to reservations. Just Food for Dogs experienced a 50% increase in click-through rate from google search to its site since publishing Street View|Trusted. 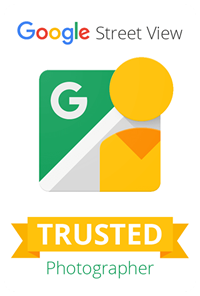 Street View|Trusted has helped boost foot traffic to the store by 20% year over year.